Fatehgarh Sahib, Sirhind : An important destination for Sikh pilgrims. This gurudwara has been built on the site where 300 years ago, Guru Gobind Singhji's two young Sahibzadas were entombed alive by the Mughals because they had refused to embrace Islam underduress of the Nawab of Sirhind. Damadama Sahib also known as Guru -Ki- Kashi Talwandi Sabo, Bathinda : Guru Gobind Singhji stayed in Damdama Sahib for nine months and it was here that he worked on the Adi Granth. He made Damdama the centre for propagating the Sikh faith and called it ‘Khalsa De Takht’ or Throne of the Khalsa. It holds great significance for Sikh for it is the place where the guru sought rest and refuge during his battles with the Mughals. Gurudwara Dukh Niwaran Sahib Patiala City : Marks the site where the 9th Prophet,Sri Guru Teg Bahadur Ji had rested while proceeding to Delhi to embrace martyrdom to uphold man's right to worship according to his belief. Tarn Taran : 24 Kms south of Amritsar. Founded by the 5th Prophet Sri Guru Arjan Dev Ji the impressive Gurudwara with gold plated dome has a holy pool. The guru used to run a leper's home here. Goindwal Sahib : Within easy reach of Tarn Taran was the centre of Sikh religion during the time of the third Prophet, Guru Amar Das ji. The deep well (bauli) in the Gurudwara has 84 steps. Whoever takes a bath here and recites Japji Sahib (divine composition of the first Prophet of the Sikhs, Sri Guru Nanak Dev ji ) at each step, and repeats the recitation followed by bath in the Holy Well 84 times, attains moksh, because he lives out 84,000 cycles of birth representing each specie created by God. Baba Bakala : 45 Kms from Amritsar. 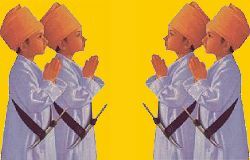 The 9th Prophet Guru Teg Bahadur had revealed himself to Makhan Shah Lubana, a Sikh devotee here. A fair is held here on the occasion of Rakhsha Bandhan. Dera Baba Nanak : (35 Kms west of Gurdaspur) Guru Nanak Dev Ji spent last 12 years of his life here. Clothes he wore at Mecca are preserved here. A fair called the Maghi fair is held here every January. We can make 3 days to 14 days Tour of Punjab Gurudwaras starting from Amritsar, Chandigarh and Delhi. Please write us starting place, number of days tour and number of people travelling to give you a cost of the Tour. The Five Gurdwaras known as the Five Takhts (Thrones) have a very special significance for the Sikh community. They are considered the seats of Sikh religious authority. Many important decisions concerning the religious and social life of the Sikh community are made here.